Prabhupāda: These two brothers, at that time their name was Sākara Mallika and Dabira Khāsa. So they were ostracized from the brāhmaṇa community. That is Caitanya Mahāprabhu’s special grace, that He accepted two rejected gentlemen from the brāhmaṇa society and made them gosvāmīs. That is the special significance of Caitanya Mahāprabhu’s movement. He accepted Haridāsa Ṭhākura from born in Muhammadan community and He made him the ācārya, namācārya. The, practically Caitanya Mahāprabhu appeared to glorify the significance of the holy name. He is actually the ācārya, namācārya, but He transferred His namācārya-ship to Haridāsa Ṭhākura. So Caitanya Mahāprabhu’s movement, kibā vipra kibā śūdra nyāsī kene naya. It doesn’t matter whether he’s a brāhmaṇa or a śūdra or anyone, if he’s kṛṣṇa-tattva-vettā, if he knows the science of Kṛṣṇa, then he can be made the spiritual master. Yei kṛṣṇa-tattva-vettā sei guru haya [Cc. Madhya 8.128]. That is Caitanya Mahāprabhu’s movement’s significance. So following His footsteps, we are preaching Caitanya Mahāprabhu’s cult and giving sannyāsa for preaching. That is not unauthorized. One who criticizes this action, he does not know the principle of Caitanya Mahāprabhu. Caitanya Mahāprabhu’s principle is anyone who knows the science of Kṛṣṇa, he can become spiritual master. This is the principle. So from the very beginning, these two Gosvāmīs… They were not in the beginning Gosvāmīs. They were Sākara Mallika, Dabira Khāsa. But they were made Gosvāmīs. And Haridāsa Ṭhākura was made namācārya. Then go on. This is the new edition of Nectar of Devotion. Prabhupāda: The brāhmaṇa community was so strong that because acceptance of service is the business of the śūdra… The brāhmaṇas, they would not accept anyone’s service. The kṣatriyas, they would not accept anyone’s service. And the vaiśyas also. They should live independently. Brāhmaṇas, by culture of Vedic knowledge. Kṣatriyas by exacting taxes from the citizens. And vaiśyas by trade, agriculture. They should live. To serve one is the business of the dog. That is mentioned in Bhāgavata. So if there is dire necessity, a brāhmaṇa can accept the profession of a kṣatriya or the, even the profession of a vaiśya, but not the profession of a śūdra. But at the present moment, because everyone accepts the profession of śūdra, therefore śāstra says: kalau śūdra-sambhavaḥ. Here is the example, that Sākara Mallika, he was brāhmaṇa, sārasvata brāhmaṇa. But because he accepted… They were learned brāhmaṇas, not fools. Very good scholar in Sanskrit and Arabian language, still because they accepted service in the Muhammadan government, they were rejected. Immediately. No. Punishment. That is punishment. In Hindi it is called hookah panibhyam. In the society, in villages still, if one is ostracized, nobody will smoke with him. Hookah. Hookah means smoking. And pani means not to accept his water. Hookah panibhyam. So that is ostracization. That was taken against Sanātana Gosvāmī. They were not gosvāmī at that time. Caitanya Mahāprabhu accepted them. That is Caitanya Mahāprabhu’s special grace. What is that word? Come on. Go on. What happened? Pradyumna: “…and Lord Caitanya later on made him the ācārya of the chanting of the holy name of the Lord, Hare Kṛṣṇa Hare Kṛṣṇa Kṛṣṇa Kṛṣṇa Hare Hare/ Hare Rāma Hare Rāma Rāma Rāma Hare Hare. Lord Caitanya’s principle is universal. Anyone who knows the science of Kṛṣṇa and is engaged in the service of the Lord is accepted as being in a higher position than a person born in the family of a brāhmaṇa. That is the original principle accepted by all Vedic literatures, especially by the Bhagavad-gītā and the Śrīmad-Bhāgavatam. 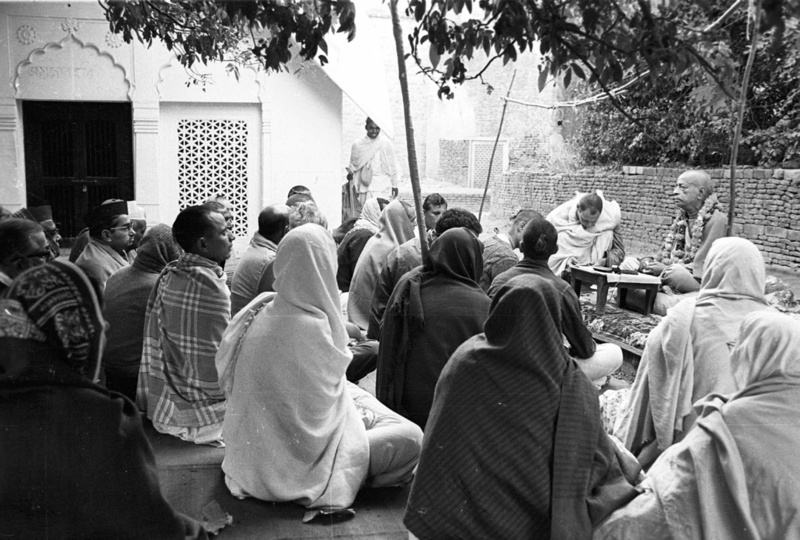 The principle of Lord Caitanya’s movement in educating and elevating everyone to the exalted post of a gosvāmī is taught in the Nectar of Devotion. Prabhupāda: In this connection, we may inform that our disciples in Kṛṣṇa consciousness movement, those who are gṛhasthas, they contribute at least fifty percent of their income. Yes. Most of them, they are full-time engaged. But if one cannot be whole time engaged… Just like we, we have got our disciple, Professor Howard Wheeler. He gives more than fifty percent of his income for developing our New Vrindaban scheme. So we try to follow these principles laid down by Rūpa Gosvāmī, that fifty percent for Kṛṣṇa or Kṛṣṇa’s devotees, twenty-five percent for personal emergencies and twenty-five percent for the dependent relatives. There are many couples here. They are married. I got them married. Sometimes I am criticized by my godbrothers. But they do not know why I got them married. Here is a couple, Gurudāsa and his wife, Yamunā, and where is Mālatī? Mālatī’s not here? Eh? Mālatī and her husband, Śyāmasundara. And another couple, Jānakī and Mukunda. I sent them first, missionary to London to start the temple. And for one year, they struggled very hard and they called me that “I started the temple.” So my Guru Mahārāja wanted to start a temple in London. He sent two sannyāsīs but it was not possible. But these gṛhasthas, they started. So we want to see that the mission is fulfilled. It doesn’t matter whether he’s a gṛhastha or sannyāsī. Kibā vipra kibā śūdra nyāsī kene naya. So by getting them married, I am benefited. They have helped me. Guest (Indian man): There is nothing against marriage. Prabhupāda: Yes. He worked very hard. Now he understands Sanskrit. He can read Sanskrit. So if I get facility for pushing on my missionary work, there is no harm in getting married. Because in Europe, America these boys and girls, they live like friends. So I said that “You cannot live as friends. You must get yourself married” and that is, that has proved… Here is a girl. Where is that Śāradīyā, Śāradīyā there? Prabhupāda: You can arrange a light here. Yes. Pradyumna: “…which had been deposited with a village banker and escaped from the prison of Hussain Shah. In this way, both brothers joined Lord Caitanya Mahāprabhu. Rūpa Gosvāmī first met Lord Caitanya at Prayāga (Allahabad, India) on the Daśāśvamedha bathing ghāṭa of that holy city and on the Daśāśvamedha bathing ghāṭa of that holy city the Lord instructed him continually for ten days. The Lord particularly instructed Rūpa Gosvāmī on the science of Kṛṣṇa consciousness. These teachings of Lord Caitanya to Śrīla Rūpa Gosvāmī Prabhupāda are narrated in our book Teachings of Lord Caitanya. Later Śrīla Rūpa Gosvāmī Prabhupāda elaborated the teachings of the Lord with profound knowledge of revealed scriptures and authoritative references from various Vedic literatures. Śrīla Śrīnivāsa Ācārya describes in his prayers to the Six Gosvāmīs that they were all highly learned scholars, not only in Sanskrit, but also in foreign languages such as Persian and Arabian. They very scrutinizingly studied all the Vedic literatures in order to establish the cult of Caitanya Mahāprabhu on the authorized principles of Vedic knowledge. The present Kṛṣṇa consciousness movement is also based on the authority of Śrīla Rūpa Gosvāmī Prabhupāda. We are therefore generally known as rūpānugas, or followers in the footsteps of Śrīla Rūpa Gosvāmī Prabhupāda. It is only for our guidance that Śrīla Rūpa Gosvāmī prepared his book Bhakti-rasāmṛta-sindhu, which is now presented in the form of the Nectar of Devotion. Persons engaged in the Kṛṣṇa consciousness movement may take advantage of this great literature and be very solidly situated in Kṛṣṇa consciousness. Prabhupāda: My Guru Mahārāja, Bhaktisiddhānta Sarasvatī Gosvāmī Mahārāja, he used to advise us to read Bhakti-rasāmṛta-sindhu. Everyone, after initiation. At least, he advised me. 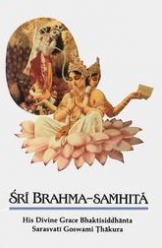 So this Bhakti-rasāmṛta-sindhu is very important as study book for the Vaiṣṇavas. It is the science of devotional service. And people are, in Western countries, taking interest. In the Temple University, it has become a textbook in the religious class. There are sixty students who are regularly studying the Bhakti, Nectar of Devotion published by us. And gradually it is being introduced in other colleges and schools. I think you are straining. Gurudāsa: The candle is coming.